Hopefully we will see more laptop makers announce OLED laptops at CES. We'll have to see what consumers say - whether they will accept the high-premium that will probably come with those OLED displays. Let's just hope the AMOLED display doesn't use harsh PWM for brightness simulation like Samsung Galaxy S6 does. It gave me a horrible migraine and eye pain after a couple of hours of viewing in low brightness. By the way LG Flex2 has an oled display and does not use PWM brightness simulation. There are many desktop monitors that do not to use PWM anymore because it's unhealthy. tftcentral has a list on their website，you can also find more information about the PWM hazards on their website. 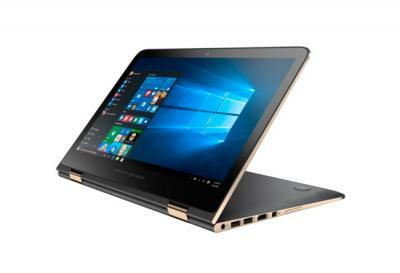 Looks like the current image above does not correspond to the actual HP Spectre x360 13 notebook and therefore is somewhat misleading. Based on the image, there may be an impression that the display is completely detachable from the keyboard part to become a standalone tablet (and so the important hardware parts like CPU and GPU should have been inside the display part and therefore have quite limited performance). But actually, unlike previous-generation hybrids, hybridness of the Spectre x360 13 is apparently implemented just as ability to rotate the display by 360° while hardware is inside the keyboard part — much like the Lenovo Yoga X1. For example, see the videos by Windows Central (also demonstrates rotation) and Digital Trends (+ photos) where the notebook certainly looks different.